The new version of the iPod can do more than just play music. You can store all your photos and videos on it as well as send and receive messages, watch movies and even browse your favorite websites. As cool as this is, it is still very possible to lose some of the photos on your iPod touch which is why it is important to always have a backup of your photos. But just in case you have lost your videos on the iPod touch and have no backup to restore from, this article will help. Read on to find out how to recover deleted videos from the iPod touch. Before we discuss how to get your videos back, it is important to note that just because the videos have been deleted doesn’t mean that they are gone forever. When you delete a file on your iPod touch, only the file marker is gone and with the right tool and the right processes, you can get your videos back. The best way to get your videos back is to use iMyfone D-Back or iMyfone D-Back for Mac. 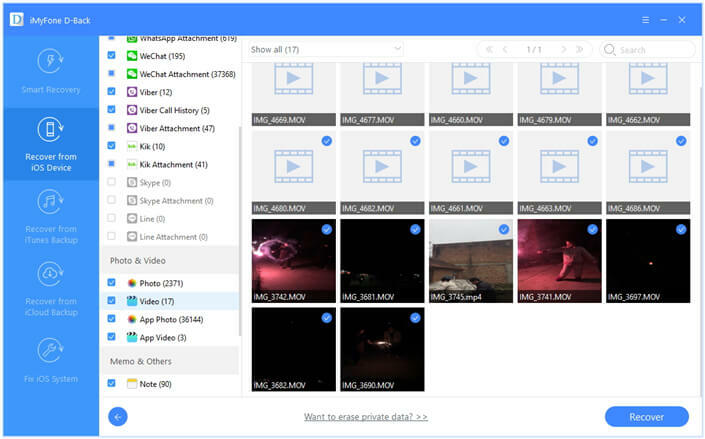 This tool is designed to help you find the hidden videos and restore them to the device. It can be used to recover the videos directly from the iPod touch or by extracting the missing videos from an iCloud or iTunes backup file. Some of the features that make iMyfone D-Back the ideal tool to recover your missing videos include the following. 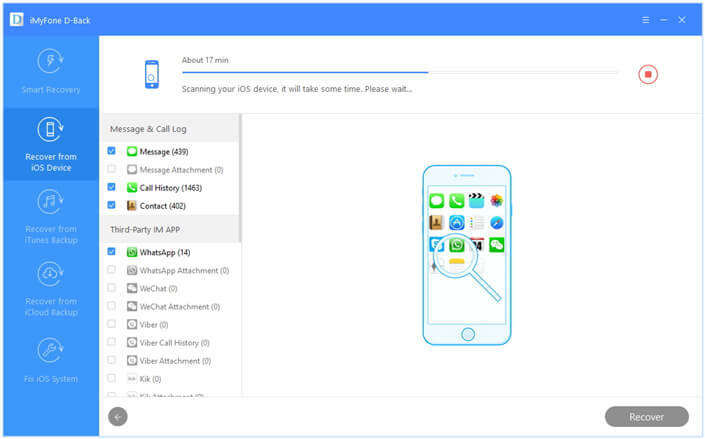 You can use it recover 22+ types of data including photos, videos, notes, voice memos, messages, WhatsApp/WeChat/Kik/Viber messages and even call history among others. It is compatible with nearly all other iOS devices and it also works for nearly all versions of iOS. You can also use it to retrieve data from your iTunes and iCloud Backup files without having to restore the whole backup. It also comes with a feature that allows you to fix a faulty iOS system. The following is a step by step tutorial to help you recover missing videos from an iPod touch. Step 1: Begin by downloading and installing the program to your computer. 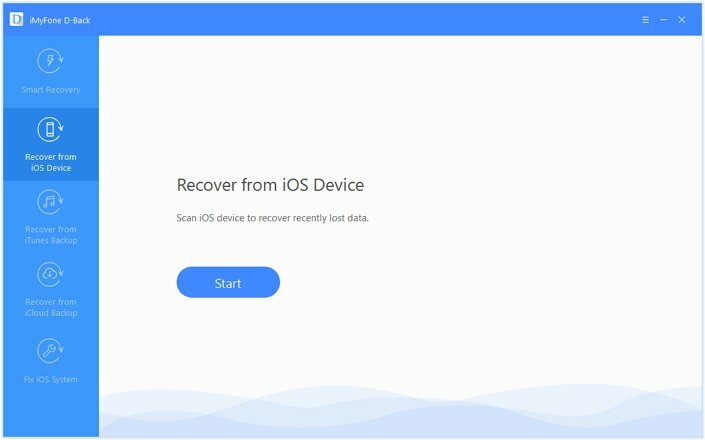 Launch it and then select “Recover from iOS device” tab. Click “Start” to begin the process and from the next window, select “Videos” since we want to recover videos. Click “Next” to proceed. Step 2: Connect the iPod touch to the computer and once the program has recognized the device, click on “Scan” to begin scanning the iPod touch for the missing videos. Step 3: The whole scanning process will take some time depending on the amount of data you have on your device. Once it is complete, click on the videos you would like to recover and then click on “Recover” to save them. Download iMyfone D-Back or iMyfone D-Back for Mac on your Windows or Mac computer now to get back the deleted videos on your iPod touch.